We present the third part of Henri de Villiers’ article on the Lenten stations observed by the church of Paris, in an English translation by Gerhard Eger. The French original was published on the blog of the Schola Sainte-Cécile; since it is fairly lengthy, we have broken it up into six parts, each covering the stations celebrated that particular week; see part one for a general introduction. 5. Monday of the Second Week of Lent: station at the collegiate church of Saint-Benoît-le-Bétourné au quartier Saint-Jacques (Sanctus Benedictus Beneversi in vico Sancti Iacobi). The cloister and church of Saint-Benoît-le-Bétourné in 1810. This church was founded in the 6th century and dedicated to the Syrian martyrs Sergius and Bacchus, and then passed to the patronage of St Benedict of Nursia in the 13th century. During the reign of St Louis, a public market was held in the cloister, and the king authorized the canons of Notre-Dame to levy a duty on the bread and wine sold in this market. The storehouses in the church’s vast cloister kept the duties in grain or wine owed to the canons. This church was strangely built originally, without regard for the traditional orientation of prayer, so that the sanctuary and the high altar faced west (and this was without a doubt the only ancient Parisian church built in a disoriented fashion). Francis I had it altered in the beginning of the 16th century in order to place the sanctuary and the altar towards the east, in accord with the usual sense imposed by the liturgical canons. It then received its current nickname Saint-Benoît-le-Bistourné (i.e. “twice turned around”) or Saint-Benoît-le-Bétourné (i.e. “well turned”). Charles Perrault  was buried here in 1703. The church was transformed into a barn in 1790 by the revolutionaries, and then destroyed in 1831 to make way for the Théâtre du Panthéon, which was itself torn down in 1854 to allow for the construction of the Rue des Écoles. The only remaining vestige of it is the old main gate of the church, which can be seen over the north façade of the Hôtel de Cluny in the garden. Saint-Benoît-le-Bétourné constituted the third stage of the Parisians’ pilgrimage in honour of St Dionysius, who is said to have celebrated Mass there and preached on the Trinity. 6. Wednesday of the Second Week of Lent: station at the collegiate church of Saint-Étienne-des-Grès près la Porte Saint-Jacques (Sanctus Stephanus de gressibus prope portam Sancti Iacobi). This very ancient church, which tradition holds was founded by St Dionysius himself, is mentioned in the Annals of Saint-Bertin in 857 as being outside the city walls, not far from the Porte Saint-Jacques. It was placed at the corner of the Rue Saint-Jacques and the old Rue Saint-Étienne des Grès (today Rue Cujas) in the 5th arrondissement. In the 11th century, the church was given by King Henry I to the Bishop of Paris, who set up a chapter there. Being from that time under the protection of the Cathedral, this church is one of the “four daughters of Notre-Dame”, a title which afforded its curé the title of “cardinal of Paris”, and the right to assist the bishop by standing at the corners (cardes) of the altar with the other cardinal priests during the Masses of the great solemnities of Christmas, Easter, and the Assumption. The chapter held twelve prebends and one chèvecerie (a chevecier was a canon charged with the maintenance of a church’s chevet and the care of its treasury and lighting), which were held by the canons of Notre-Dame by turns (in turno). The bell tower and the chapel of Our Lady of Good Deliverance date from this period. The qualifier des Grès (“of the steps”) appears for the first time in a charter from 1219, probably to distinguish it from the church of Saint-Étienne-du-Mont, also founded around this time. The term refers to the steps (de gressibus) one had to mount to enter the church by the door in the Rue Saint-Jacques. In the 14th century its portal was redone and lasted until the Revolution. 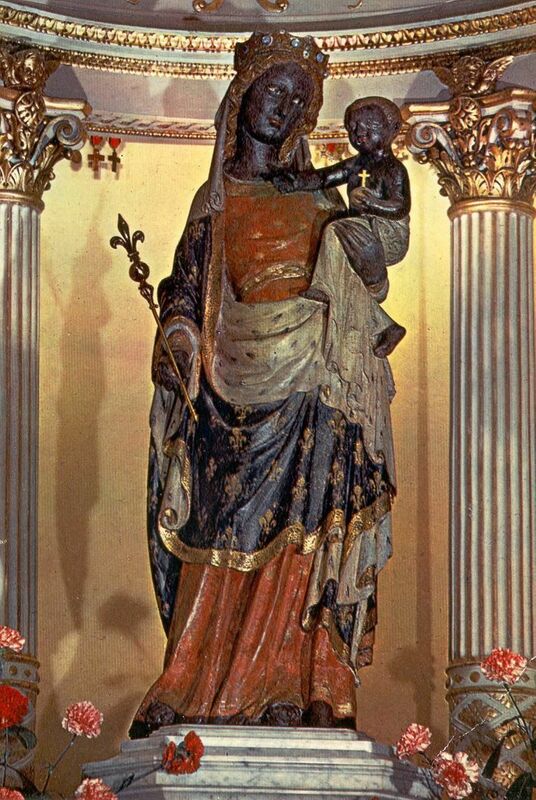 Beginning in the 14th century as well, the statue of Our Lady of Good Deliverance became the object of particular veneration, and was especially popular during the course of the Wars of Religion, during which she was invoked as vanquisher of all heresies. In 1533, the Confraternity of the Charity of Our Lady of Good Deliverance was founded. Endowed by the Holy See with numerous indulgences, it quickly counted 12,000 members, including King Louis XIII and Queen Anne of Austria, who enrolled in 1622. Francis de Sales, who believed himself damned, recovered peace and confidence at the feet of this statue of Our Lady of Good Deliverance; in 1692, a chapel named for him was erected in the church in memory thereof. Such successes did not pass without disputes between the canons of Saint-Étienne-des-Grès and the confraternity; the latter was even dissolved by the Parlement of Paris in 1737, but re-established in 1774. The miraculous statue of Our Lady of Good Deliverance is currently kept in the convent of the Sisters of St Thomas of Villanova in Neuilly-sur-Seine. Saint-Étienne-des-Grès was closed on 12 July 1790 and destroyed in 1792. Some remains of its exterior walls and of its buttresses survived until the extension of the Faculty of Law in 1876. Its holy water font was well-known because it was surmounted by the famous paleo-Christian inscription ΝΙΨΟΝΑΝΟΜΗΜΑΤΑΜΗΜΟΝΑΝΟΨΙΝ, a Greek palindrome meaning “Wash your sins, not only your face”, also written on one of the pillars of Hagia Sophia in Constantinople. Saint-Étienne-des-Grès constituted the second stage of the Parisians’ pilgrimage in honour of St Dionysius, and one could there venerate the relic of his crozier. 7. Friday of the Second Week of Lent: station at the priory church of Notre-Dame-des-Champs au Faubourg Saint-Jacques (Beata Maria de Campis in suburbio Sancti Iacobi). The church of Notre-Dame des Champs and the Carmelite convent at the beginning of the 17th century. Tradition holds that Saint Dionysius first established himself around here when he arrived in Lutetia, as Paris was then called, and preached about the love of the Virgin Mary. After the conversion of the region to Christianity, a church was erected and dedicated to the Virgin on the ruins of an ancient Roman temple of Mercury. This church was later named Notre-Dame-des-Vignes, since the place was encircled by vineyards at the time. King Robert the Pious (996-1031) ordered that it be enlarged to honour the place where Saint Dionysius is said to have celebrated the holy mysteries, and later the church became a priory of the Benedictines of the Abbey of Noirmoutier. The monks uprooted the surrounding vineyards and renamed the church Notre-Dame-des-Champs (“of the fields”). A crypt of this sanctuary survives in the basement of building 14bis in the current Rue Pierre-Nicole. In 1604, the Benedictines ceded Notre-Dame-des-Champs to the Duchess of Orléans-Longueville, who installed some Carmelites from Spain who made their monastery one of the most renowned in the 17th century. It was hither that, amongst others, Mademoiselle de La Vallière and Madame de Montespan  retired. During the Revolution, the Carmelite convent was closed and the church destroyed, only the memory of its presence remaining in the name of the street, Rue Notre-Dame-des-Champs. In 1856, a parish, detached from Saint-Sulpice, was created for the neighborhood, and it naturally received the name of Notre-Dame-des-Champs. A provisional wooden chapel was set up on 153 and 155 Rue de Rennes. The cornerstone of the new church was laid on 17 March 1867 and, eight years later, on 31 October 1876, the church was blessed. Of neo-Romanesque inspiration, its building was entrusted to Léon Ginain. It was dedicated on 25 March 1913 by Cardinal Amette, archbishop of Paris. Notre-Dame-des-Champs constituted the first stage of the Parisians’ pilgrimage in honour of St Dionysius. A French author and member of the Académie Française (1628-1703). Both were mistresses of King Louis XIV. Thanks a lot for your precious work!